I attended the Students’ Union’s ‘Redefining Disability Panel’ last week, which I think utilised some really well developed questions from Samuel Cornelius-Light (Students’ Union Disabled Students’ Officer), and the panel had a range of different backgrounds and experiences that they shared which were thought provoking and passionately delivered. The importance of active listening was highlighted on multiple occasions in regard to how to best communicate with and support those with particular needs. In addition to challenging assumptions of what the lives of disabled people might look like – sport, performing on stage, going clubbing, ballet were all mentioned as activities enjoyed by the panelists and adaptation being the key for inclusion for all. I felt fortunate to be a member of the audience, however if there was any criticism to be had, it would be that it was a shame there wasn’t a bigger audience for this fab panel to interact with. Back in October I made the trip to London to attend a breakfast meeting hosted by Gender Networks. This is a network specifically for people who lead, chair or coordinate networks in their own organisations, across a broad range of sectors and industries. The Gender Network aims to support networks, at all stages of maturity, and offer to help network leaders find mentors from across sectors to help them take their network where they want it to go. Their meetings are an opportunity to be informed of the latest issues, as well as a chance to hear from a broad range of speakers, and an opportunity to share best practices. This is a membership organisation, and UWE Bristol’s Women’s Forum Coordinators had been invited to attend as guests of Vanessa Vallely OBE. Vanessa, pictured above is an author, speaker and entrepreneur and is best known for launching We Are The City as a vehicle to help women progress in their careers. Vanessa also founded the diversity forum Gender Networks, the Rising Star Awards and TechWomen100 awards. A number of staff from UWE Bristol have won Rising Star Awards historically, including Jessica Coggins and Janice St. John-Matthews. Vanessa is an Officer of the Order of the British Empire (OBE) for her services to Women and the Economy. One of the highlights of my day was meeting Vanessa, who despite her status is both warm, and approachable, as well as inspirational. The meeting was being hosted by Investec, who are part of the network. Members take it in turns to host the quarterly meetings, and they usually take place in London. Investec are known for their zebra, and attendees were delighted to see the zebra was also in attendance! (See image in top left of tweet above). The whole event only took a total of 2 hours, beginning at 8am with a breakfast reception and an opportunity to meet fellow attendees. Most of the women I spoke to were based in London, however some had traveled from Manchester and Leeds, including Simone Roche, CEO and founder of Northern Power Women. Despite being a short event, it was definitely action packed! After an introduction from Vanessa and a welcome from our Investec hosts, where they told us about their Taboo series, and the work they’d done to bring sceptics on board, as well as how they’d opened up their women’s network to male allies. We were then treated to a round up of gender related news from Harriet Minter who is a journalist and broadcaster. Harriet talked us through how companies can ensure maternity leave does not hurt a woman’s career, how Facebook have gotten into trouble for targeting their job adverts, the importance of gender allies in public as well as private spheres, the rise of working mothers, and the need to have women on boards. Following the round up of the news, Vanessa encouraged us all to do some speed networking, with a twist. Vanessa encourages networking at all the events she hosts, and has noticed that people tend to network with people that look like themselves. All the blondes talk to blondes, the people with glasses find someone else with glasses. Therefore Vanessa set us the challenge of talking to someone who didn’t look like we did. I thought this was an interesting approach, and while enforced networking can often feel a bit forced, or awkward, fortunately this didn’t! This was followed by table work, where the room organised themselves into small groups and shared their local successes, plans, and best practices. Following this was a series of inspirational speakers, which began with Ann Francke, author and CEO of the Chartered Management Institute. Ann spoke about the gender pay gap, a topic she is an expert in, and one she has spoken about very regularly. Ann talked about the Broken Window Effect – this is a criminology theory, and refers to the work undertaken by New York City Police Commissioner William Bratton in 1990s in which tackling small crimes such as graffiti and broken windows lead to a reduction in crime rates. Ann argued that by tolerating small gender slights we are a long way off solving the bigger issues, such as the gender pay gap. Ann was followed by Heather Melville, OBE. Heather talked about the need to diversify networks, and that by diversifying speakers it can encourage a diversified membership. Heather also spoke about the importance of sustainable networks and the need to encourage new leaders. She talked about the risk of a network hinging on one person, and that if that person leaves, it is possible the whole network can fall apart. Not only this, but it is a good development opportunity to bring new leaders on board, and it doesn’t have to mean you, as a leader, leaving the network entirely. Heather was followed by Sherry Coutu, CBE. Sherry spoke about Founders4Schools and the importance of children, and particularly girls, needing role models, and how these are not always evident in their family or local community. Therefore Founders4Schools aims to inspire school aged children to reach their potential by providing them with role models, and in particular role models that they can relate to. All in all it was an action packed, inspiring couple of hours, and there’s definitely lessons that UWE’s Women’s Forum can learn from the speakers. And what’s more these lessons are easy to share with any of the other staff networks at UWE, particularly around sustainable networks and diversifying speakers, to in turn diversify membership. By Sarah J. Davies – Social Work Placements Co-ordinator. April 2018. The field of Social Work has developed a method or philosophy called the ‘strengths-based’ approach which can be liberating for everybody to consider using. When applying a strengths-based approach to student or staff learning, we focus on what the individual can already do, rather than on their problems, limitations or ‘lack’ of particular skills and knowledge. As part of the strengths-based approach, the student would be seen as empowered, “capable of solving their own problems,” and taking a pro-active part in their learning rather than UWE (and its partner educators) being the ‘experts’ who diagnose a student’s situation and determine what should be done (See www.oxfordbibliographies.com). The ‘strengths-based’ approach demands a more collaborative relationship between the student and UWE. The student is encouraged to take the initiative in identifying systems and strategies to support them on their journey towards completing a qualification. At UWE, inclusivity is a core value, and the diverse student population is one of our greatest strengths. In my role as the placements co-ordinator for Social Work, one of the biggest challenges can be securing placements for this diverse population. For many years, our partner Practice Learning Co-ordinators would receive the batch of student papers and we would have a similar conversation. Very often, the Co-ordinator might express concerns at the students’ age and lack of direct experience. And each time I would remind them that we measure our undergraduates by aptitude, not experience. The truth of the matter is that sometimes students coming straight from school can be perceptive, with a lot of experience relevant to their chosen profession, and then sometimes they are not. Occasionally, a student in their 40s can have less professional awareness than one in their early 20s. So age is clearly not the right benchmark for assessing people. The strengths-based philosophy offers an alternative view which helpfully focuses on students’ skills and knowledge. A young student, for example, could be seen as part of an IT-savvy generation who might be quick to understand the benefits of social media and flexible enough to move with rapid technological change. Such learners might be fast to pick up complex local authority IT systems for the managing of cases and care packages within the Social Work profession. In the past, conversations with Practice Learning Co-ordinators used to end with an agreed compromise – I would offer to ring the students to fish for information and see whether the given résumé could be improved. For example, on one occasion, I rang a young student with a notably sparse employment history and prepared to improvise. I was left wondering why they hadn’t written this down. Had the student come to see paid work with small children as such low status work that it didn’t qualify as ‘social care’, but as a more elaborate form of ‘babysitting’? Perhaps there were cultural perceptions involved? In the years that followed, we shifted to working with a more strengths-based approach. We organised preparation sessions, involving our Practice Learning Co-ordinators, to teach students the value of their own previous experience. Transferable skills gained in pubs and shops, such as customer service and administration, were definitely relevant to the ever-changing Social Work profession. On the one hand, some agencies might justifiably need to know. Residential settings (for looked-after children, for example) sometimes have good practice guidelines about the gap in age between the oldest service user and youngest member of staff (not less than five years). In the past, some secure units, such as young offenders’ institutes, used to follow a similar policy. We chewed over our distinctly ‘UWE’ undergraduate problem. – The ‘young student’ question is less of an issue for Bristol University, who run a master’s programme only and can therefore guarantee a higher age threshold for its cohorts of social work trainees. Age can, of course, be guessed at from earliest employment years, but somehow we felt that the act of removing this box from the front page would make youth less prominent. We consulted with colleagues at Bristol University, compared, and contrasted template placement forms. No age, gender or ethnicity there. For all the extra layers of administration, we decided to chuck in a ‘curved ball’ and go for it. Age is now ‘out’ of our forms and to see how we got on, you will have to watch this space . . . This year the LGBT+ Society, UWE Feminist Society and The Students’ Union brought together a cross campus programme of events around the theme of allyship. We invited the UWE community to #ShowYourTrueColours and join us in a month of celebration, education and awareness. This included free films, HIV fast testing, workshops on gender & intersectionality, discussions about pinkwashing, arts & LGBT+ resistance, Bisexual Visibility, queer history monologues and LGBT+ takeover of Lock In! As well as an incredible reading & resources list produced in collaboration with UWE Library. Our main goal this February was to invite UWE students to #ShowYourTrueColours, encouraging LGBT+ students to be proud of who they are, and to not be afraid to express themselves at university. We achieved this through launching our Ally Campaign. This meant bringing together student representatives and staff members from across the university in a show of solidarity for the LGBT+ community, promoting the idea that you don’t have to be a member of the community to support it. None of these events could have been possible without the incredible work of the LGBTPlus Society Committee and members. They managed to come up with a broad range of activities to ensure that there was something for everyone this month. 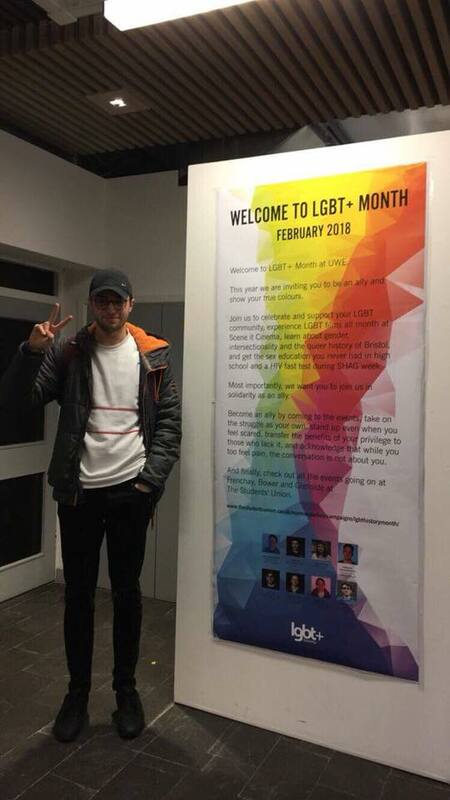 Together, with Marianna the SU’s National, Faith & Identity Societies Coordinator, we have had a more diverse and well organised LGBT+ History Month than ever. 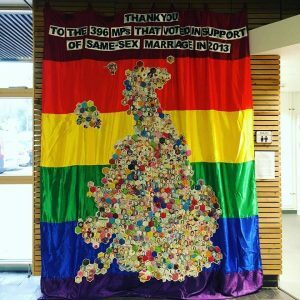 It’s important that we appreciate the work put into this month, as it is important that the students here raise awareness of the issues faced and milestones achieved by the LGBT+ community from UWE and beyond. As LGBT+ Officer, I have become very involved in the conversation on trans student rights. After the SU wellbeing survey revealed 98% of trans students have suffered from mental health issues, I felt it important to facilitate trans students needs and make their university experience easier. Therefore during February, I have also started liaising with the UWE facilities team through the SU to establish more gender neutral toilets in the university. At present, the only gender neutral toilets exist in the SU building and the new X Block. The university has agreed to change any single cubicle gendered toilets around the university into gender neutral toilets. They have also committed to building gender neutral toilets into all new buildings. As part of the LGBT+ Month campaign and the theme of allyship – working with the university we have developed Trans Awareness posters to be put in toilets across all three campuses. 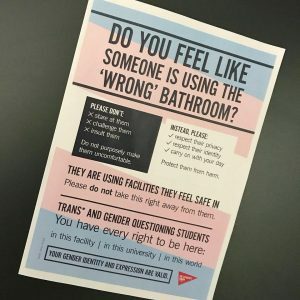 We are encouraging students to respect others’ privacy, identity and continue as normal if they are questioning someone’s right to use a specific bathroom. This is important because transitioning students may find it hard to adjust to using their preferred gender toilets. This may be due to fear of judgement. Having a bathroom accessible to either gender is a safer option. We are doing everything we can to make the environment for students transitions as comfortable as possible. Rt Hon David Lammy MP, author of the Lammy Review launched the 2018 Equity Speaker Series on Wednesday 24 January at the UWE Bristol Exhibition and Conference Centre. Lammy, who is an popular campaigner and outspoken social and political commentator, spoke on the topic of ‘The Confidence to Be: What next for the BAME graduate?’ Following the talk, 200 delegates enjoyed networking and a Caribbean inspired canape reception courtesy of Calypso Kitchen restaurant , the brain child of UWE Bristol Alumnus Will Clarke. A number of pro-diversity organisations were also in attendance as exhibitors to promote opportunities to BAME students.